• Clean out roof drains to keep water from accumulating. • Clean out dry wells so there is a safe place for water to collect. • Repair landscaping to ensure water will run away from structures. • Back up all the data on computer or servers in case they get wet. • If possible, consider installing generators in case of a power failure. • Create an emergency contact list. PHOENIX – As mayor of a desert city, Greg Stanton’s job description wouldn’t seem to include filling sandbags in anticipation of flooding. But he did just that Monday to send a message: After moisture from a hurricane walloped the Phoenix area last week, another storm could cause flooding later this week. “It’s to give messages to this community about how we can best be prepared for this upcoming rain and possible flooding,” Stanton said. Joined by Vice Mayor Jim Waring, Councilwoman Kate Gallego and other officials, Stanton visited a fire station on the city’s south side – one of a number of places where residents can load up on sand and bags at no cost. With Waring and Gallego helping, Stanton demonstrated the most effective way to use the bags, filling them only halfway with sand so they can be placed strategically around a home. After last week’s record rainfall, with more than 3 inches recorded at Phoenix Sky Harbor International Airport, the city is monitoring weather reports as Hurricane Odile moves north in the Pacific Ocean off Mexico. “I’m not naïve; when significant flooding happens here there’s going to homes that get flooded,” Stanton said. Stanton’s other tips included cleaning out roof drains and dry wells and repairing landscaping to create a different paths for water. The mayor declared a state of emergency after last week’s storm and said it will remain in place as long as it’s needed. “It will allow our city management to respond as quickly as possible without concern of procurement issues, because that’s what the people need and expect,” he said. Gallego encouraged residents to visit the city’s three Recovery Information Centers, set up to connect those who suffered damage with resources and information. “The more we know about how many people were impacted the more effectively we can advocate for federal resources,” she said. 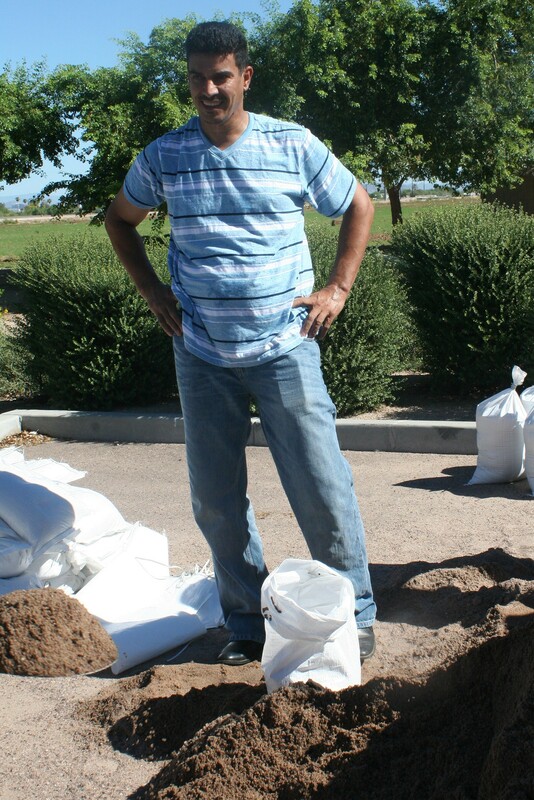 Home Depot provided the sandbags available at Phoenix Fire Station 57, which Stanton visited. Frank Mass, an area resident, loaded the back of his pickup with sandbags. He said water from last week’s storm flooded his patio and that he isn’t taking chances with the next storm. “I’m going to put them around, put them in place, give me a break,” he said. Abdullah Alkhaledy said flooding in his neighborhood got too close to his home for his comfort, so he visited the station to be prepare for another round. “I don’t have the kind damage of the water get into the house, but we got leaking from some area in the roof because I believe it is heavy rain,” he said. Stanton said that officials are working together so the city is as prepared as it can be, adding that last week’s storm gives him confidence it will be. “As mayor, I was very proud of the response of government entities, the private entities, and most importantly I was very proud of the people of this community,” he said. 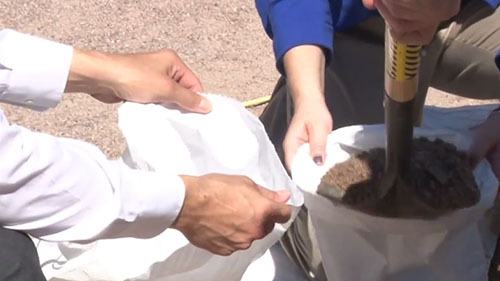 Phoenix officials are urging residents to prepare for future floods with sand bags and other cautions. Reporter Megan Thompson shows us how Phoenix is preparing for aftermath rains of Hurricane Odile. 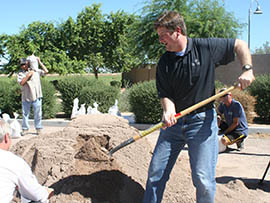 With Vice Mayor Jim Waring helping, Phoenix Mayor Greg Stanton demonstrates how to fill a sandbag Monday. 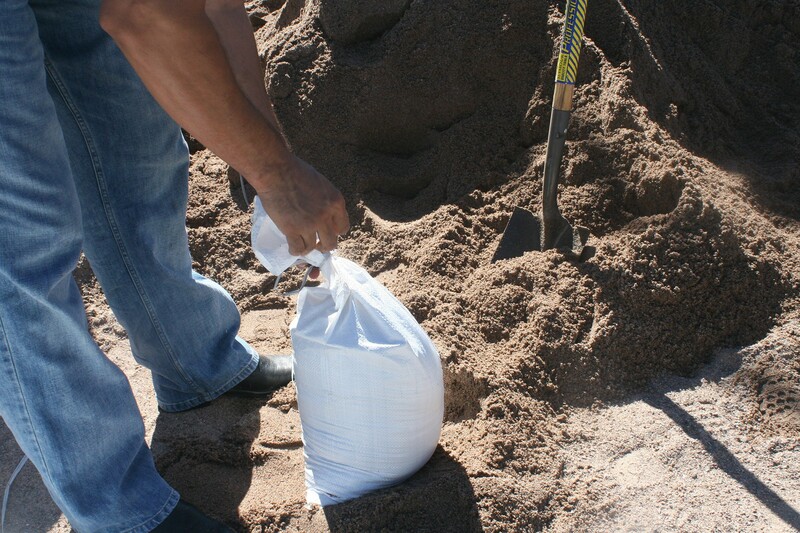 Locations for sand and sandbag pickup in the Phoenix area. Abdullah Alkhaledy takes a break from filling sandbags, which he will use to prevent flooding around his home. Home Depot provided sand and bags for residents at Phoenix Fire Station 57.